Set in Prince George’s County, Maryland, The Newton White Mansion offers a historic yet elegantly laid back setting for nuptials, convenient to the Baltimore, Annapolis and Washington, DC region. The property’s stately Neo-Georgian brick mansion combined with its modern atrium suits a variety of wedding styles, from traditional to contemporary. The glass-enclosed atrium brings the outdoors inside, creating a tranquil environment for a wedding reception with lovely views of the golf course and surrounding gardens. 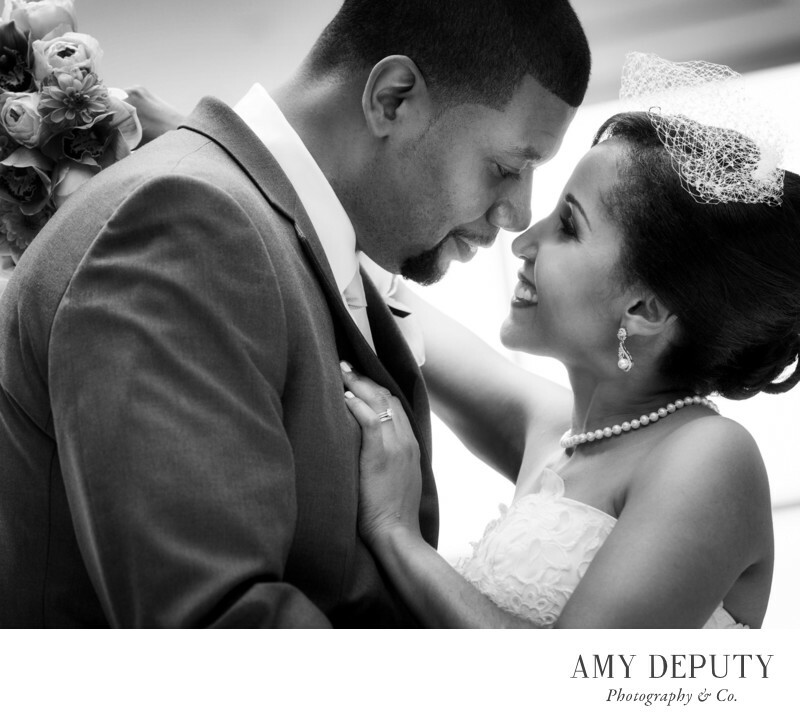 The couple pictured above, Tiesha and Max, decided on a tropical wedding theme. The bright hues of turquoise, green, and coral blended seamlessly with the lush, tree-lined backdrop viewable through the wall-to-wall glass. In contrast, the relaxed, island vibe was offset by Tiesha’s more formal wedding style. The bride wore a feathery hair fascinator, lace gown, and pearls for a modern twist on a vintage 1940s bridal look. This study in contrasts — breezy tropical casual and classically polished —worked beautifully in the location. Newton White Mansion was the perfect wedding venue for such complimentary variations in style. Location: Newton White Mansion: 2708 Enterprise Rd., Mitchellville, MD 20721.